My wife and I traveled to a "local" dark sky site on Friday night. This particular site is about an hour's drive distant. It's located near the summit of the Blue Mountain and offers some shelter from the wind and sixth magnitude skies. As a result of its wind-sheltering properties, the horizons are somewhat compromised. I was rather surprised that my wife wanted to come along, as she hasn't accompanied me on a one-night run to a dark site in many years. We arrived at approximately 11:30 p.m. EDT and departed around 3:40 a.m. EDT. Four fellow Chesmont Astronomical Society members were already present and one showed up after we got there. The transparency wasn't quite the best but was good enough that I had no complaints. The summer Milky Way was plainly visible. The seeing was better than the CSC had predicted but the wind never died down to the degree that some of the forecasts had indicated. The result was a drastic change from the sweltering heat and humidity of a couple nights prior. I wore boots and insulated socks, jeans and sweat pants, and two jackets. I didn't bring one of my telescopes along due to my still-healing right shoulder but I had two binoculars. During the course of the night, I observed the following deep-sky objects through the 10x50s and 15x70s: M3, M4, M6, M7, M8, M11, M13, M15, M22, M23, M24, M25, M31, M33, M39, M52, M103, NGC 457, NGC 869 and NGC 884 (the Double Cluster), NGC 6939, NGC 6946, NGC 7789, Collinder 399 (the Coathanger), LDN 42 and 1773 (the Pipe Nebula), Stephenson 1, and Stock 2 (the Muscleman Cluster). The telescopes that I had occasion to use were a 102mm Celestron Omni XLT 102 achromatic refractor, a 6" (150mm) Celestron achromatic refractor, a 180mm APM Deluxe Achro achromatic refractor, a 10" Meade Dob, a 12.5" ATM Dob, and the big gun, a 25" Obsession Dob. Some of the DSOs seen through those telescopes included M11, M13, M16, M17, M27, M57, M101, M102 (NGC 5866), NGC 40, NGC 457, NGC 6207, NGC 6675, NGC 6818, NGC 6960, NGC 6992-5, NGC 7009, NGC 7331, NGC 7332, NGC 7335, NGC 7339, Stock 2, and Trumpler 1. The 180mm APM refractor provided some excellent widefield views of objects such as the open cluster NGC 6939 and the face-on spiral galaxy NGC 6946 (the Fireworks Galaxy) simultaneously with a 17mm Tele Vue Ethos, the Double Cluster, and Stock 2. It was quite fitting, of course, to see the Fireworks Galaxy, which I had requested, through the big achromat. NGC 6946 has been the host galaxy for nine supernovae in the past 100 or so years, hence the nickname. What I enjoyed most while using the 180mm, however, was scanning through the Cygnus Loop or Veil Nebula complex at 36x with an OIII-filter and the magnificent 30mm 88 degree AFOV Leitz Planokular, which is my favorite low-power, widefield eyepiece. The Planokular is no longer manufactured and was extremely expensive. Browse www.ericteske.com/2013/12/the-muscleman-cluster-stock-2-open.html, for more on Stock 2. I hadn't seen Trumpler 1 in quite some time. The high-power view of this odd little open cluster through the 180mm was quite pleasing. I enjoyed observing M11 and NGC 6818 through the 6" Celestron refractor, NGC 7009 through the 10" Meade Dobsonian, and M27 and M57 through the 12.5" Dobsonian. 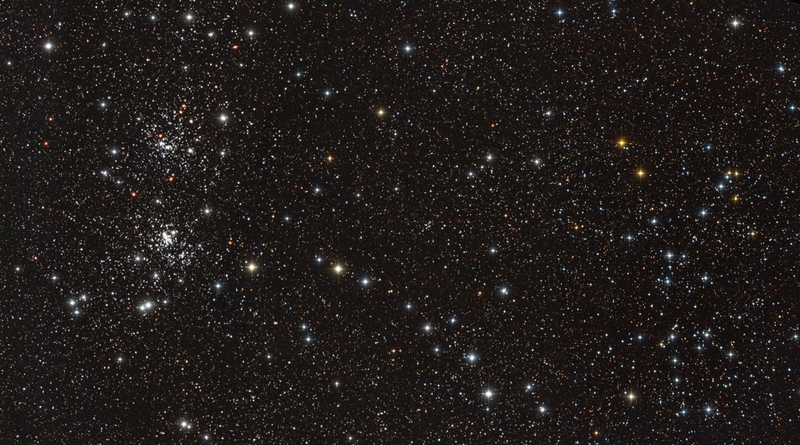 The 25" Obsession yielded a very fine view of the galaxies NGC 7332 and NGC 7339 in Pegasus. Over the course of the night, I witnessed several passes of artificial satellites and two extremely bright Iridium flares within a minute or two of each other at approximately 2:58 a.m. EDT in the southeast. The brighter one was, to the best of my knowledge, Iridium 70, which reached magnitude -6.8 in Aquarius. The first flare was not listed on Heavens-Above. I also caught two rather bright meteors, one of which left a momentary train. Great report Dave ! Thanks. My Avatar: Venus & Moon Occultation 4/22/09.